We ran that night when they arrived. The ground wet with August’s breath. of Uncle Usmanu’s bald head. after us like a frog. and talk and talk and walk from road to road. The night folding itself into our eyes. as a mark of respect. Goodbye, we would bid. D.M. 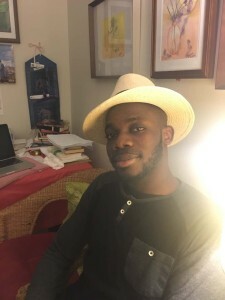 Aderibigbe is from Nigeria and came to the US for graduate studies in 2015 and earned his MFA in creative writing from Boston University as a BU Fellow and also received a Robert Pinsky Global Fellowship. His chapbook is In Praise of Our Absent Father. He knows God loves you. This entry was posted in Advisory Panel Contributors and tagged August Visitors, D.M. Aderibigbe, ETYMOLOGY OF HOPE. Bookmark the permalink. God loves the words you put to paper. We do also.